Although you can go beyond what ChromeCast was designed to do and stream your local video content onto your ChromeCast dongle with the Google Chrome browser, you may be asking how you would do this on an Android smartphone. Luckily, there is a way to do it now. Koushik Dutta, of ClockworkMod and ROM Manager (just to name some of the things he has worked on), recently announced that he has developed the first ChromeCast app called AirCast. 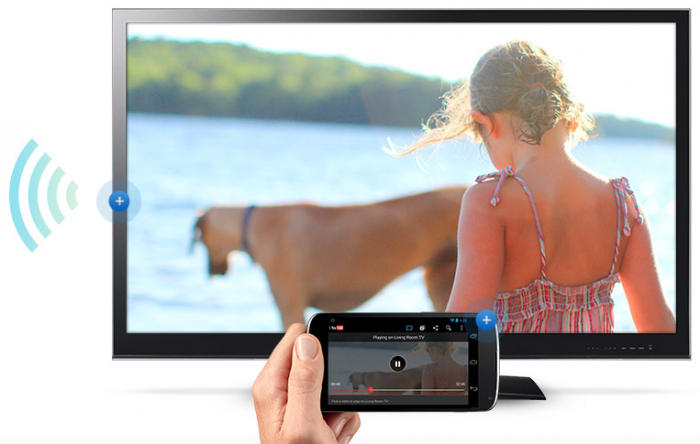 Essentially, the app allows you to stream videos from your Android device to your ChromeCast. To get your local content onto your ChromeCast dongle, you need to download Koushik’s AirCast application, which is currently only on his website (Download Link). After download the application, you need to sideload the application by enabling installation from unknown sources by going into the Android’s settings, then select Applications, then check to enable “Unknown Sources: Allow installation of non-Market applications”. After you enable the installation from unknown sources, install the downloaded file. After you installed the application, go to your file explorer program or file gallery app (like File Browser, ES File Explorer, Google Drive, Dropbox, etc), and locate a piece of video you want to play on the ChromeCast. Select the video file and tap the share button. A pop-up will let you decide where you want to share the file with, of one being the AllCast. Select AllCast and a window will pop-up asking you which ChromeCast you want to share it with (if you have more than one ChromeCast dongle). Select one of the ChromeCast devices you have and you should be immediately greeted with an on screen control panel and information on which video it is currently playing. As of right now, the application is in beta and it is set to self-destruct (deleting the app by itself) in a few days as he is trying to get feedback and bug information; but expect to not have that problem in the near future when the app is finalized.